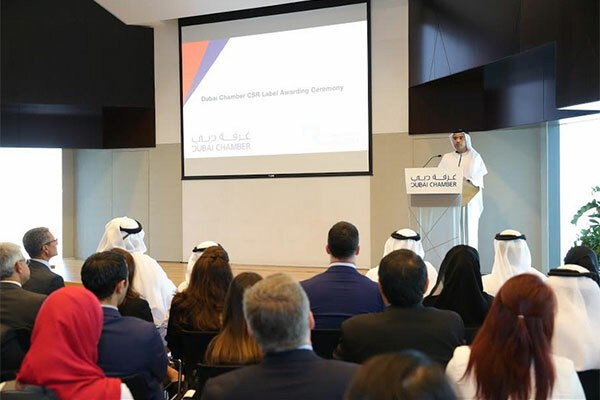 The Dubai Chamber of Commerce and Industry has honoured 37 companies for their corporate social responsibility (CSR) and sustainability efforts during a recognition ceremony held at its premises today (March 15). The Dubai Chamber CSR Label was presented to Al Futtaim Carillion, Al Rostamani Pegel, Amlak Finance, Apparel Group, Blue, Chalhoub Group, CHEP Middle East, Clyde & Co, Corporate Business Services, Daikin Middle East and Africa, DC Pro Engineering, Dimara International, Drydocks World, du, Ducab, Emirates Transport, Empower, Emrill Services, Enova, Future Pipe Industries, Information Fort, Intercoil International, MAB Facilities Management, Mashreq Bank, National Bank of Fujairah, Paramount Computer Systems, Quick Registration, Qurum Business Group, Roads and Transport Authority (RTA), School Transport Services, Summertown Interiors, Tecom Group, UAE Exchange, Union National Bank, Veolia, wasl Asset Management Group and Zulekha Hospital. Majid Saif Al Ghurair, chairman of Dubai Chamber, explained that the CSR Label was established by the chamber many years ago as part of its efforts to encourage and honour outstanding companies for their CSR and sustainability efforts. He noted that the response to the CSR Label and its overall significance has grown in recent years, as Dubai’s business community has increasingly become more aware of the importance of adopting CSR and sustainability practices and strategies. “Companies that receive the label are not just gaining recognition, they are also setting an example for the rest of the business community. We are confident that the recognised companies will continue to build on their progress and encourage others to follow in their footsteps,” Al Ghurair said. He revealed that Dubai Chamber is planning to soon launch a new and improved CSR Label Framework, and said that companies in Dubai will be able to apply for the label in the current cycle. “With the Year of Zayed now upon us, we expect to see many more companies take a proactive approach to implementing CSR initiatives with the aim of boosting their social impact. Businesses in Dubai have a very important role to play in supporting this national initiative,” Al Ghurair added. On their part, the honourees thanked Dubai Chamber for its valuable support in providing a framework for companies to benchmark and enhance their CSR performance, as well as the opportunity to promote their activities and enhance their reputation. Since its launch, the Dubai Chamber CSR Label has served as a diagnostic framework and management tool for the participating companies to gauge their approach to CSR and sustainability best practices, and asses their organisations’ impact on the environment and the local community.